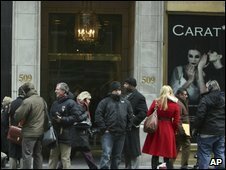 A French investment manager who put $1.4bn (£1bn) into Bernard Madoff's fraud-hit scheme has killed himself in his New York office, police said. Rene-Thierry Magon de la Villehuchet, 65, was found sitting at his desk with both wrists slashed, New York police spokesman Paul Browne said. A bottle of pills was found near him, but there was no suicide note. 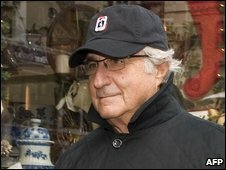 Mr Madoff is accused of running a $50bn (£34bn) Ponzi scheme that wiped out investors around the world. Big funds like Mr Villehuchet's were especially hard hit. Paris newspaper La Tribune said he spent the past week trying "day and night to find a way to recoup his investors' money". Mr Villehuchet, who was married without children, was co-founder of money manager Access International. Mr Madoff's fraud has ensnared Wall Street investors and charities around the world, although the full extent of the losses is as yet unknown. He is under house arrest in his Manhattan apartment, and his assets have been frozen. Another investor who gave Mr Madoff $2m (£1.35m) to manage has taken legal action against US financial regulators. Phyllis Molchatsky, a 61-year-old retiree from New York, is seeking $1.7m in damages from the US Securities and Exchange Commission. It is believed to be the first attempt by an investor to recover losses from the SEC.